Today I have put together three recipes that you can give as gifts and/or keep for your Hanukkah or post-Christmas table. All three are extremely easy to prepare, possibly even at the same time. The mustard seeds need an overnight soak but otherwise this trio of condiments is straightforward. They also require a minimum of kitchen skills, so shouldn’t stress you out during the time of year when many home cooks are up to their eyes in fiddly cake decorating and gingerbread house making (that isn’t me though). The Anderson Family Christmas Tradition, of sorts: Christmas is always at our house these days, which suits me fine. There are only six of us on the day, so it tends to be a low-key affair food-wise, no turducken or whole turkey. The idea of the turducken slightly alarms me so I am glad to have the excuse of a small family not to try it. Anyway, we traditionally open our presents during the late morning, fortifying ourselves with smoked salmon blinis, which we make by mixing fresh lemon juice and grated horseradish into creme fraiche, smearing it onto heated up mini blinis and topping with folded shards of best Scottish smoked salmon, dill fronds and tiny lemon pieces. If Christmas lunch is more veering into early dinner territory I may also put together homemade sausage rolls. For this I will on Christmas Eve mix together butchers’ sausage meat with some crushed fennel, a pinch of dried sage, a bit of chilli, some salt and some onion and garlic powder. Come the morning one of us, whoever is not still wrapping last minute gifts or rattling things under the tree, will wrap the seasoned meat in sheets of puff pastry, brush with milk and cut into little nuggets for a quick blast in a hot oven. We enjoy these treats with a glass of champagne or prosecco while opening presents. Caution: late present opening only advised for those with older children and adults who act their age. From then on Mr A and I will take it in turns to consult the posted time table for what needs cooking/heating up when. Unlike many British families we usually have a gammon, boiled the day before and quickly roasted on Christmas Day. This I do Nigella style in Coca Cola (I know, weird. But good) and then burnish in the oven under a honey-mustard glaze (this year using my own mustard!). But it is mostly – as would be expected from me, I suppose – about the vegetables and various permutations thereof. I stick to my American heritage, with my lovely and fellow-foodie mother-in-law bringing along the British elements of chestnut stuffing – a glorious puddle of creamed chestnuts, clove and nutmeg-laced bread sauce, Christmas pudding and brandy sauce. During the preceding week I will make up chestnut, celery and onion laced cornbread stuffing (this is close to what I do for us), sweet potato souffle sans marshmallows (why marshmallows??? ), spiced red cabbage, roasted parsnip and carrot puree (with nutmeg, thyme, mustard and creme fraiche), and cranberry sauce (with port, orange and star anise). The day before Mr A, Miss R and I will blanch tiny fresh Brussels sprouts, par-boil an unseemly amount of Maris Piper potatoes for roasting in goose fat (the cooked leftovers of which are the pot washers’ perk), boil up the gammon for roasting on the Day, and any other prep that we can get away with that allows us to spend maximum time with our family. Chutneys can be as simple or as complicated as you like. At this time of year (Christmas), and at this stage of the festive preparation game (T minus 7 as I write), I am keeping it simple. 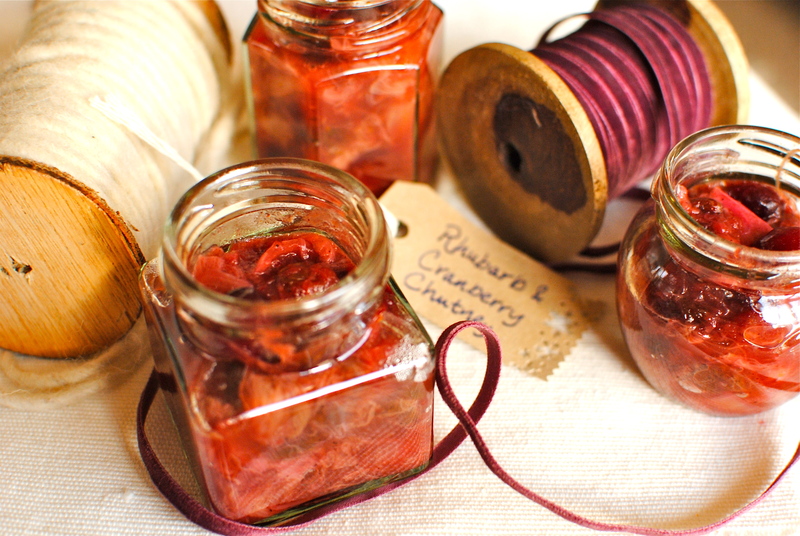 Although I am making this for Christmas gifts, this recipe should ideally be made whenever your region’s rhubarb is in season, using frozen cranberries. 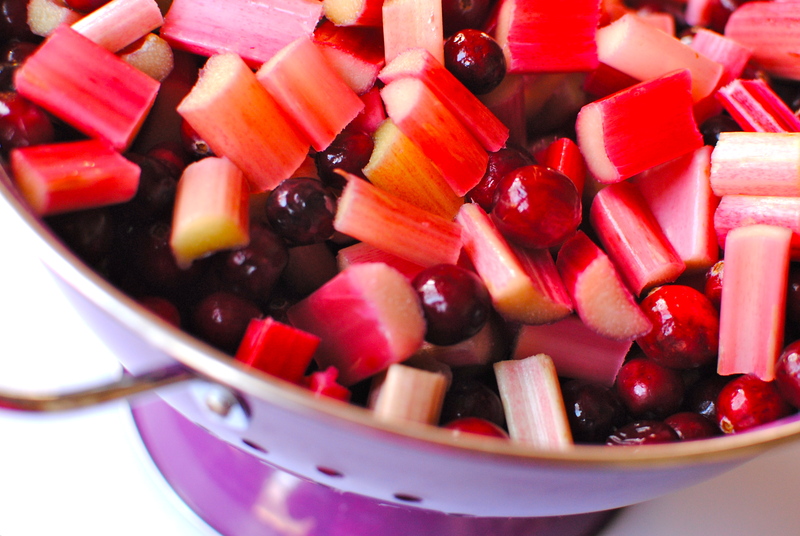 Right now in Scotland, along with an abundance of half-price cranberry offers, we are starting to get local early forced rhubarb, with the bulk coming in from Holland. I have used the Holland grown stuff, as the finer-flavoured local variety will be lost in chutney (and it is extremely pricey). 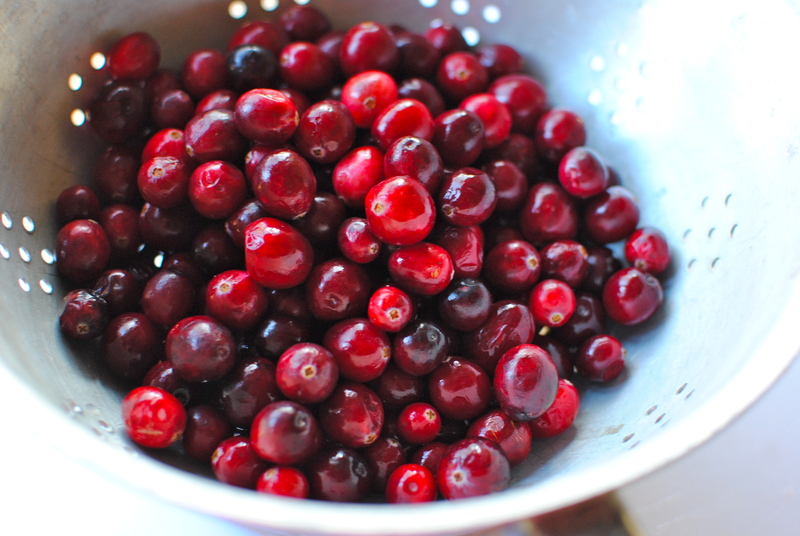 If you can’t get fresh rhubarb and your supermarket doesn’t stock frozen – or you don’t fancy the rhubarb – here is a lovely recipe for spicy cranberry squash chutney from American food blogger and Twitter friend of mine, EA Stewart. Most chutneys require at least a 2 month maturation to be at their best but I have found that providing you like the tang of vinegar, this one is lovely after a only a week. It will continue developing and mellowing over the weeks so if you can keep out of it for a month or so you will be rewarded with a deeper flavour. Well-stored chutney will keep for a couple of years, so it is worth making a double batch and storing date-labelled jars in a cool dark place. This recipe requires only some chopping, some stirring and jar sterilising. And a chunk of time. I have given jar sterilising instructions in my Tawny Seville Marmalade recipe, but here is more detailed advice specific to chutney making from allotment.org.uk. Whatever jar sterilising method you favour, unless you have vinegar-proof lids, it is important to provide a barrier between your chutney and the lid. A wax paper disc is most commonly used, but as you see, I have just cut a square of parchment paper. Not fancy, but does the trick. This is a vital step to prevent the lid being corroded. Sorry to sound a bit scary and school-marmy, but I have in the past had to throw out chutney and lids because I missed out this step. Pop everything into a large stainless steel pan (aluminium will taint the chutney) and slowly bring the ingredients to the boil, stirring occasionally with a wooden spoon (again, to prevent taint). This is the hard part really as you will be tempted to whack up the heat to get this large, pan-filling mound going. Your patience with the heat and stirring will be rewarded by producing a well-textured chutney. 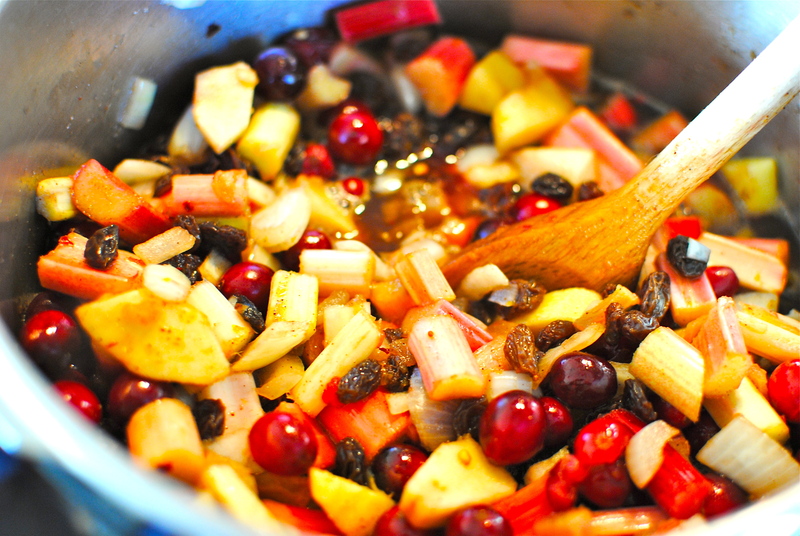 Let the chutney simmer – uncovered – for 1 ½ hours at the least, maybe go for 2 hours. The longer the simmer the more mellow and glossy the chutney becomes. Stir more frequently during the last half hour of cooking; the sugars will be more concentrated with the waning liquid level and apt to stick to the pan. 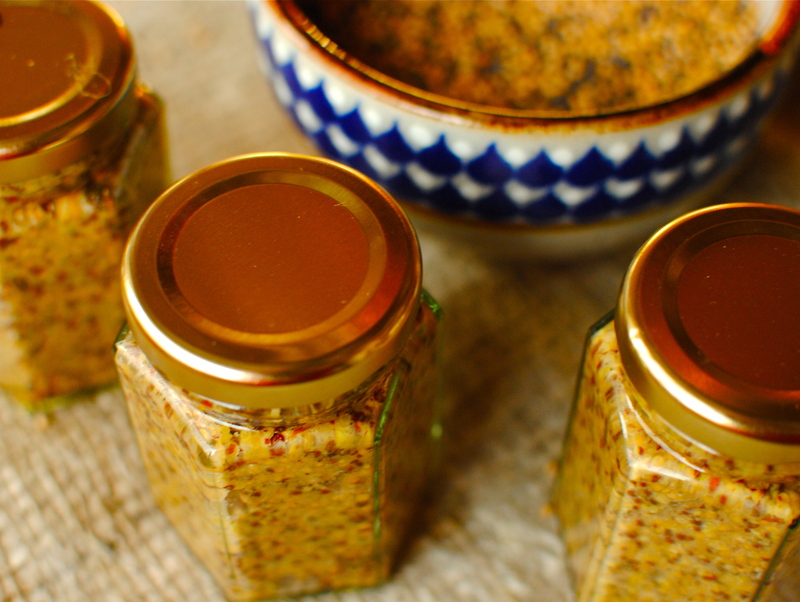 This chutney is wonderful with cold meats, cheeses, bread, crackers – all the usual chutney partners. It is also great rolled into bread or spread onto puff pastry dough to make savoury-sweet palmiers, in grilled cheese and mixed with yogurt for a spiky crudite or chip dip. You should get 5-6 x 340g jars’ worth of melting, glorious chutney. P.S. Because I was losing my natural light, I snapped the opening image for this blog post before the chutney was ready; it hadn’t darkened and broken down to the glorious jammy consistency of the final product. I ended up scooping it back into the pan and cooking for a further hour! 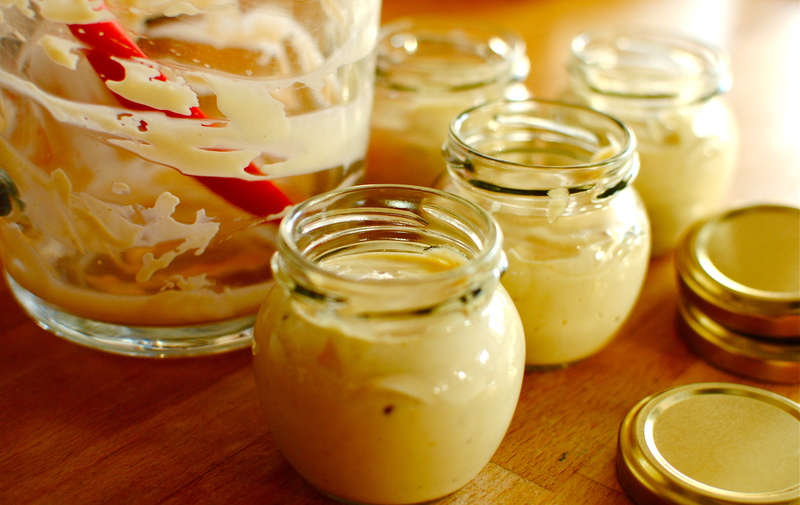 Mayonnaise is one of those food stuffs that we tend to take for granted. Always in the fridge waiting for whatever simple or exotic foods it will be the lubricant to, it is really nothing to get excited about. Not that there isn’t good stuff out there; I rate the Delouis brand as the closest to homemade that I have tried. But I don’t recall ever thinking, “mmm, mayonnaise”. Until that is I chanced upon this recipe. Off and on for years I have been looking for a simple mayo recipe that didn’t require exquisite timing, arms like steel bands and excruciatingly precise oil-pouring. This, dear readers and fellow food adventurnauts, is it. You can keep your Delia and her complicated directions, this is the one for me. Bung it in a beaker and whiz it up with a hand blender. Job done. Unlike commercial mayo, which is fine for most sandwiches, this easy peasy mayo can take centre stage with cooked seafood for dipping. Go a little further and blend up a perfect Marie Rose sauce, or add herbs and organic yogurt for a stunning vegetable dip. Sure, have the Hellman’s or whatever you like for the more mundane tasks, but for something a bit more do try this. As with most simple things, the quality of all of the ingredients is paramount, so organic eggs, good mustard and flavoursome apple cider vinegar are recommended. I have adapted this from a heritage recipe I found at the tail-end of Yotam Ottolenghi’s Plenty, which called for coriander, more garlic, sugar and oil, and no chipotle. He recommends it as “the best addition to a grilled chicken and tomato sandwich.” We will use it on Boxing Day, with the Rhubarb and Cranberry Chutney and the Wholegrain Mustard, to fancy up the Ieft-overs, but I can’t wait to try it in egg salad. What will you try it with? Put the first six ingredients in a jug. Using a hand blender, process them a little and then start adding the oil in a slow, steady trickle. Once it starts to thicken (the sound from the hand blender will deepen a little too), pour more rapidly until it is completely amalgamated. If you want a less stiff mayonnaise you may not need all of the oil. I have used as little as 350ml and it worked out just fine. 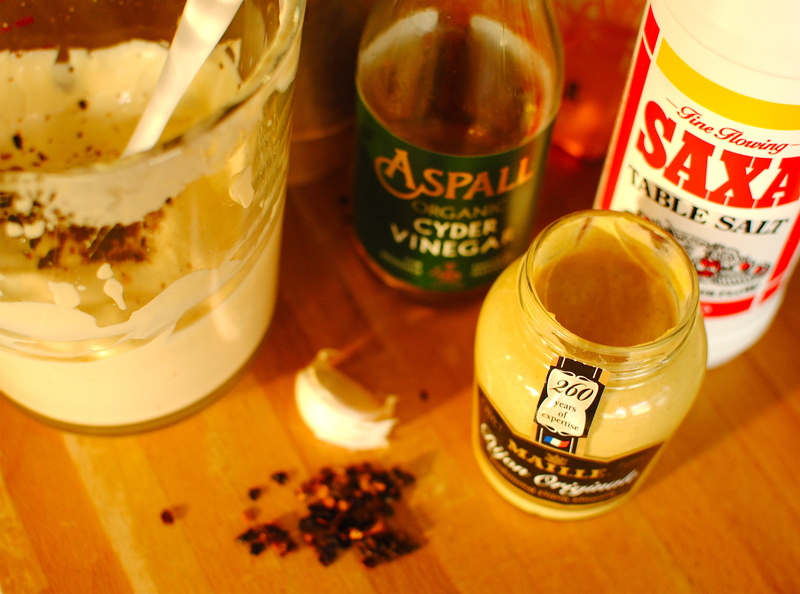 Scrape the mayonnaise into a clean jar or into several small jars and refrigerate. The mayonnaise will keep for 2 weeks. Caution: because of the raw egg, those on active cancer treatment, or with low immunity, should not consume this product. Whiz the seeds in a clean coffee grinder or a mini chopper – or with a pestle and mortar – for about 20 seconds. You are wanting them to be mostly whole but some broken and powdery. 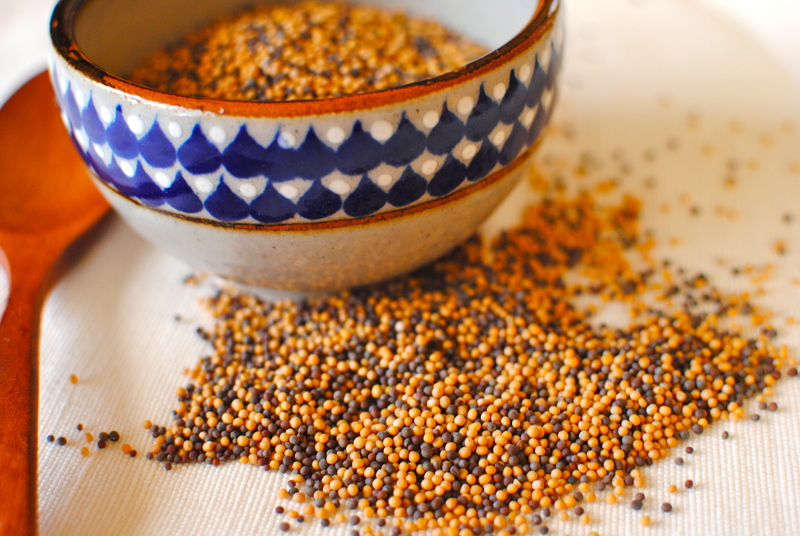 Soak the mustard seeds in the water or alcohol overnight. When you are ready to make the mustard up put the soaked seeds and the remaining ingredients into a blender and pulse until you get a paste with some whole grains. Add a little more liquid if need be, but only a little. Divide between two jars or into four or five smaller ‘gift’ jars. 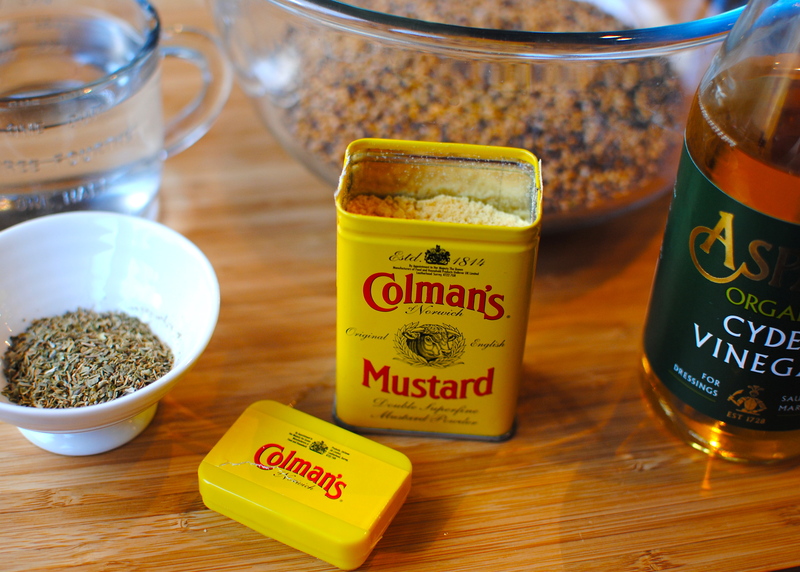 Allow the mustard to ‘marinate’ for at least 12 hours before tasting, as it will be quite bitter when just made. This keeps well when using the dried herbs. If you use fresh herbs, store in the refrigerator. Gorgeous. Love these edible gifts! Thanks Ms Lizzy. I bet all of this winter sounding stuff is weird to you! Do you do turkey, roast potatoes and all the trimmings, or something more seasonal for you? Wow, that mayo would get my vote! I hope that you have a lovely, peaceful and relaxing Christmas. Best wishes. That makes me feel proud. I hope you have a great Christmas up North. Make lots of snowmen! Thank you Miss Jackie! Wishing you a wonderful Christmas with your family. Don’t let your kids eat you out of house and home! 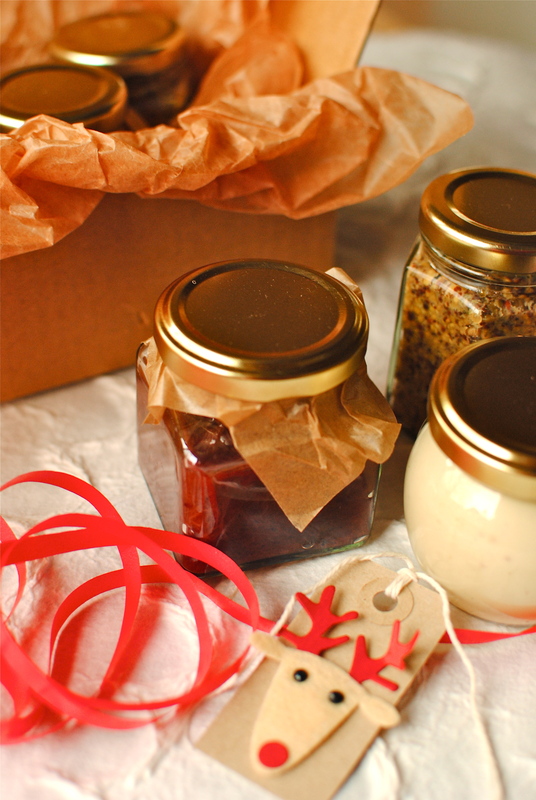 All your homemade presents look delicious! And, I loved reading about your family Christmas traditions too-I’m thinking salmon blinis sound like a fabulous appetizer! Thanks so much for sharing my squash chutney recipe…I’m so happy to have found your beautiful blog earlier in the year :-). Merry Christmas to you and your family! Merry Christmas to you too. 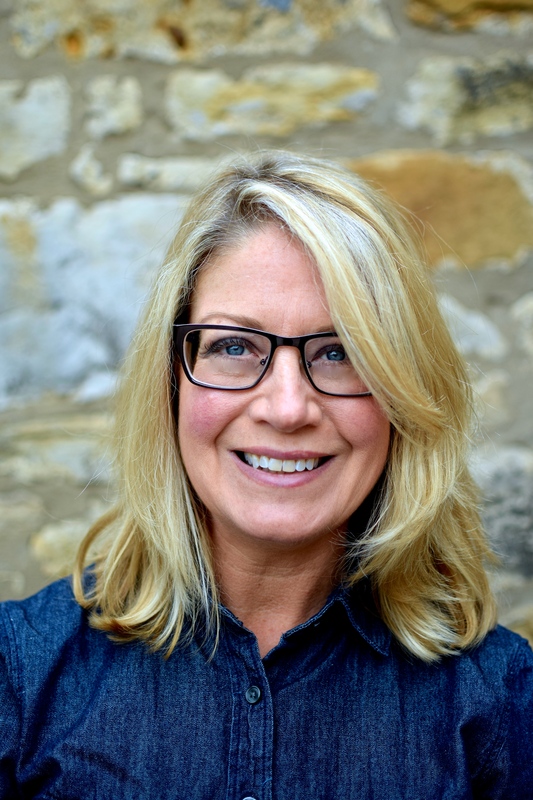 It is wonderful that two people who may never meet can have a friendship through blogging.You have a wonderfully inspirational site – I learn something every time I read it. Look forward to all of your posts and chat. PS Smoked salmon blinis are delicious and real no-brainers! As I am one of the lucky people sharing Christmas day in the Anderson home, my mouth is watering already! I’m not going up North. Me and Danté are staying here. I hope you have a great time together. NO snow though, huh? Too warm this year, that’s for sure. We’ve had colder Julys!